National Philanthropy Day is a national day of celebration, created to recognize and pay tribute to the contributions that philanthropy, and philanthropists, have made to our community, and nation. 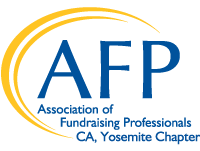 WHAT: The Yosemite Chapter of the Association of Fundraising Professionals (AFP) will host the 2016 National Philanthropy Day Awards Luncheon. Please note: Past awardees are not eligible to win for the same category. They may however be nominated for a different category.